TSPSC Forest Beat Offcers/ Section Officers /Range Officers Results 2018: TSPSC Forest Beat Offcers/ Section Officers/Range Officers Exam date, Hall tickets, Answer keys, Results 2017: TSPSC FBOs, FROs, FSOs Recruitment Hall tickets, Exam date, Answer key 2017. TSPSC Forest Officers Recruitment Exam 2017 Hall tickets, TSPSC Forest Officers Recruitment Exam 2017Admit Cards, TSPSC Forest Section officers Hall tickets, TSPSC Forest Beat Officers Hall tickets, TSPSC Forest Range Officers Answer Key/Hall tickets. 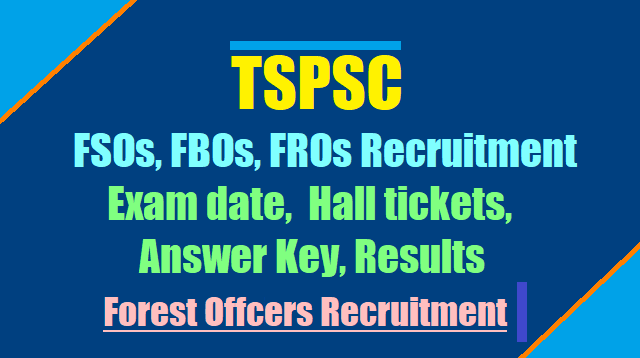 TSPSC Forest Section officers Forest Beat Officers Forest Range Officers Answer Key/Hall tickets, TSPSC Forest Section/Beat/Range officers Answer Key/Hall tickets, TSPSC Forest Officers Recruitment Exam 2017 Hall tickets Answer Key Results. It is hereby informed that the List of Hall Tickets Numbers of the candidates provisionally admitted to Physical Test and Events for the post of Forest Beat Officer on the basis of written examination held on 29/10/2017 FN & AN is hosted on the Commission’s Website (www.tspsc.gov.in). The Physical Test and Events are scheduled from 02/07/2018 onwards at concerned Local Districts of provisionally Admitted Candidates. Further details of venue-wise day-wise schedule will be announced shortly. Candidates should visit the Commission’s website from time to time for updates. The candidates who successfully qualify in Physical test and events will be called for verification of certificates. On the basis of written examination held on 22/10/2017 FN & AN for the post of Forest Section Officer in Forest Department vide Notification No.47/2017, The provisionally admitted candidates who are qualified in Physical test and events are called for certificate verification with required certificates/documents which is to be held on 26-06-2018 & 27-06-2018 at Poti Sree Ramulu Telugu University, Near Public Gardens, Nampally, Hyderabad by 10:00 A.M. onwards. The candidates are hereby directed to exercise post preference/Web Options for post in Un-reserved, Local and Agency area (for Schedule Tribe candidates). The facility will be available from 22-06-2018 to 25-06- 2018. The candidates should avail this facility from 22-06-2018 onwards. Please visit the Commission’s website (www.tspsc.gov.in) for further details. Telangana State Public Service Commission (TSPSC) invited online application from eligible candidates for the post of Forest Beat Officer in Forest Department (EFS&T) in the state of Telangana. The recruitment is for 1857 vacancies. The minimum eligibility qualification to apply for the post is 10+2 or intermediate from a recognized board. The selection of the candidates would be made on the basis of a written examination, physical test and medical test. The pay-scale for the advertised post is Rs. 16,400- Rs.49,870. Telangana State Public Service Commission (TSPSC) invited online application from eligible candidates for the post of Forest Range Officer in Forest Department (EFS&T) in the state of Telangana. The recruitment is for 67 vacancies. The minimum eligibility qualification to apply for the post is Batchelors Degree from a recognized board. The selection of the candidates would be made on the basis of a written examination, physical test and medical test. The pay-scale for the advertised post is Rs. 31460-84970 .